This week ASIFA-Hollywood announced nominations today for the 35th Annual Annie Awards recognizing the year’s best animation across film, television, commercials, video games and short subjects. “Robot Chicken” and “Robot Chicken: Star Wars” were on the impressive list of talent. Winners will be announced at an awards ceremony on Friday, February 8, 2008 at UCLA’s Royce Hall, in Los Angeles, CA. Fans of the Robot Chicken: Star Wars special might be curious to know how exactly the crew lit that scene where President George W. Bush has a lightsaber duel with former president Abe Lincoln. Get a behind-the-scenes look at “Robot Chicken” with a special report from the Oct. 2007 issue of Wired magazine. Co-creators Seth Green and Matthew Senreich, as well as the producers Corey Campodonico and Alex Bulkley of ShadowMachine Films, talk about the success of “Robot Chicken” — including their most recent Star Wars special. Since its debut in 2005, Chicken has helped the cable channel set ratings records and has enjoyed brisk DVD sales. When the Palpatine snippet found its way onto YouTube last year, it generated more than a million views, creating a flock of new fans — and eventually hatching a 30-minute Robot Chicken: Star Wars TV special. Just ask George Lucas, who was so tickled after seeing the Palpatine sketch that he gave Robot Chicken rare carte blanche to craft a half-hour Star Wars parody. 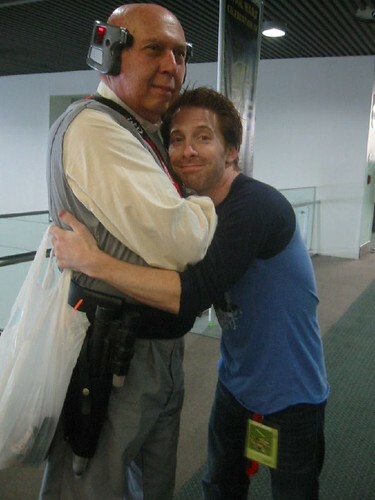 He even voiced his own plaid-shirted Mini-Me for one skit and hosted a screening of the special at Skywalker Ranch. “George got really complimentary,” Green recalls. “I leaned in and said, ‘I want to do two sequels and three prequels — if you’re cool with it. '” And why not? As Lucas himself might put it: Today Coruscant. Tomorrow, the world. IGN TV: What are your plans as far as a DVD release of Robot Chicken: Star Wars? Will it be included with Season 3 or will it have an independent release? You know, we’re actually talking about that right now. There’s a lot of different conversations being had, so I’m not entirely sure how it’s gonna pan out. My expectation is that it will be its own DVD. We’re just trying to figure out what content will be on it, in addition to the special. IGN TV: “Family Guy” has their own Star Wars special coming. Did you get to boast to Seth [MacFarlane] that you beat him to it? No. He and I don’t have that kind of competitive relationship. We were both just so giddy about the fact that we get to make Star Wars. Although we called each other during the production, because we were writing them around the same time, just kind of conferring and making sure we weren’t stepping on each other’s joke toes. What’s cooler than a monkey with a lightsaber? Not much. Lucky for you, Stoopid Monkey — Seth Green and Matthew Senreich’s cool production company — the folks who created “Robot Chicken,” and of course “Robot Chicken: Star Wars” special on Adult Swim bring you the limited edition Stoopid Monkey Jedi Knight t-shirt available exclusively on StarWarsShop.com. This fashionable t-shirt puts a spin on the popular Star Wars traditional Jedi t-shirts. Wearing the shirt not only shows your allegiance to the Force, but may just make a few “Robot Chicken” fashionistas jealous. “My friends who have worn it haven been stopped in the supermarket, gym and even a bank by ‘Robot Chicken’ fans asking where they could buy one,” Senreich says. Robot Chicken: Star Wars Special – Get it Now! 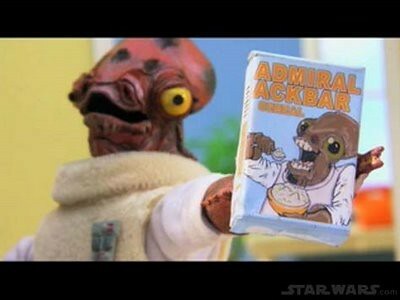 As seen on Adult Swim, view the complete 22-minute Robot Chicken: Star Wars special at StarWars.com. Be sure to check out the Robot Chicken: Star Wars Behind the Scenes to take look at the making of the Robot Chicken: Star Wars special. In addition to the in-depth coverage on starwars.com, the media (TV, radio, print) is all a flutter over the upcoming Robot Chicken: Star Wars special, to air Sunday, June 17 during Cartoon Network’s Adult Swim. Watch it on Adult Swim and also check it out on starwars.com that same day. You are currently browsing the archives for the Robot Chicken category. Make A Star Wars Movie!